She loved preparing the Easter dinner for our family, and we knew that on her well-prepared table we would find the tasty Italian peas. Once she and papá became older, we enthusiastically took on the job of preparing the holiday dinners. Naturally, she wanted to contribute “something,” she was an Italian mamma after all. and invariably it was either Italian peas with mushrooms at Easter or her broccoli casserole at Christmas, but the broccoli story is for another time. Invariably, it was either Italian peas with mushrooms at Easter or her broccoli casserole at Christmas, but the broccoli story is for another time. There was a special glow about her when she had everyone under one roof, and she was able to feed us. Yes, she fed us delicious meals, but it was more, with every bite we knew she was feeding us food made with love. Mamma worked a lot of hours at the cookie factory, but I never heard her complain that she was too tired to cook or to do anything for us. Her family was her life. Making them happy was what made her happy. During the summer the three kids and I would spend several weeks visiting with them. My Honey had to work — this was his busy time so he’d drive us out there then he would pick us up. Mamma took her vacation during this time. She wanted to spend every minute she could with us. My Honey and I are truly blessed. We have such treasured memories of Easters, Thanksgivings, Christmases and all of the in between holidays spent with parents who cared — parents who saw to it that we grew up to be responsible, caring parents who will carry on their traditions and make some of our own. Buona Pasqua e Buona Primavera! A wonderful spring time combination of sweet peas, onions garlic and mushrooms plus the addition of a flavorful broth. Heat olive oil and butter in a large lidded skillet over medium heat. Saute onion and garlic until onion is translucent. Be careful not to burn the garlic. Add the sliced mushrooms and continue to saute until the mushrooms release some of their liquid and they start to lightly brown and become fragrant. Add the broth, peas,Tuscany seasoning, salt and pepper. Cover the pan with lid and cook until peas are tender, about 5 minutes. Serve immediately or keep warm on very low heat until ready to serve. Note: Recipes and content from All Our Way©2015 are copyright protected. Please do not use content or recipe without prior written permission. If you want to share the information, please link to this post. Thank you. 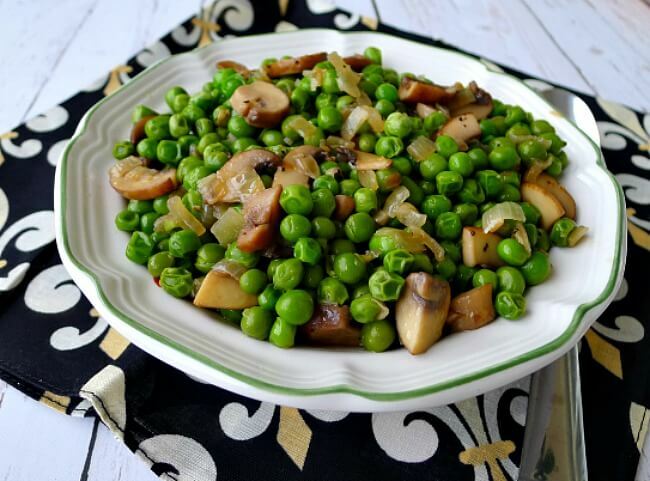 Fresh peas with mushrooms for Easter lunch, can’t go wrong. Such a delicious, vegan and colourful dish to enjoy the people you love. Yum I love fresh peas this time of year! And I’m not sure I’ve made them Italian style before. Am very intrigued! Thanks so much for sharing :). I absolutely love flavors in this recipe. Peas are such a great side to any meat dinner. We love it with steak or with beef. I must save this recipe and make it next time I’m roasting a beef. Love this tradition! I have never had peas for Easter, but you are making me rethink my menu! That must be so yummy! I will be making it tonight! That’s truly amazing Eastern traditional recipe. 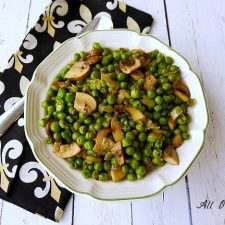 Mushroom and peas is a classic combination that my family loves. I’d love it with grilled meat all year long. Simply delicious! This reminds me of Easter with my gramma. We do a very similar dish. I looooooove peas so this one is gonna be perfect for me!! Mushrooms are my absolute favorite i always love to have them as a side with my breakfast! and so are peas with holiday dinners , i will try this 🙂 Thanks for sharing ! Mushrooms are my absolute favorite i always love to have them as a side with my breakfast! Such a perfect and classic side dish! This would go with a variety of meals. Family dinner memories are the best, aren’t they? This recipe sounds so delicious, what a great side! A great change from the standard peas! Look forward to trying these! Family recipes are my favorite and this is such a beautiful food story with its heartfelt origins. I’ve always been a lover of peas and I wish I was there when you made this one from your mom! Great recipe and story, Marisa, thanks for sharing! Beautiful traditions to carry on. Love is always the secret ingredient of any Italian recipe. Love funghi e piselli. It makes a great pasta sauce too! Love the sound of this side dish. Your story reminds me of my childhood as well. Mom’s and baba’s feeding families. Nothing was fancy, but it was ALWAYS delicious. I saw your recipe on Pinterest and had to swing by for a closer look. What a family treasure to share and really a nice addition to any dish. Simply scrumptious! Thank you for sharing this recipe. I’d love this side dish on my Easter table! Hi, Alyssa! It is a family favorite including the little ones. Thank you for your sweet comment, Marci! Yes, indeed, mamma’s food was special because of the love she put into it. You have the best recipes! Looks like a delicious side dish! Hi, Nancy! It really is a very easy side plus it tastes good. Marisa, your writing is filled with the love you have for your family. That is a truly wonderful thing! Pinned and shared. I do love my family, Teresa. It’s a joy to remember and talk about them. I am definitely going to try this recipe and I promise to prepare it with love. As is your tradition. That is the secret, Clearissa!! Thank you, Dee!! I appreciate all of your support. 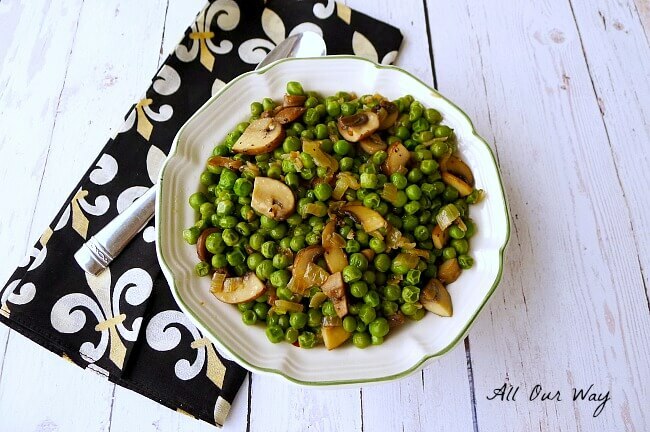 Peas and mushrooms are irresistible to me and besides, this is such a nice-looking dish. And your memories attached with it are even nicer! Thank you, Saima! Meal time with family was always very important. Marisa, *that* is my kind of family tradition! I love peas, could eat them every day, but I’ve never had them like this. Must add it to my repertoire! I loved reading your fond memories of how you were raised by caring parents. Thank you, Jean! I sure hit the jackpot with parents and in-laws too. Just adding the mushrooms to the peas makes them extra-special. I’ve never seen peas paired with mushrooms before. I know my hubby would have loved it when he was allowed to eat mushrooms, back then it would have made him smile. a great and delicious idea for Easter table ! Buona Pasqua Marisa, un abbraccio ! Ciao, Chiara! I hope you and your family are doing well. Buona Pasqua e un abbraccio forte! Thank you, Natalie! Yes, traditions keep us tied to the past but it’s an important link to the future. Have a great day! Such a beautiful post and a flavorful recipe. 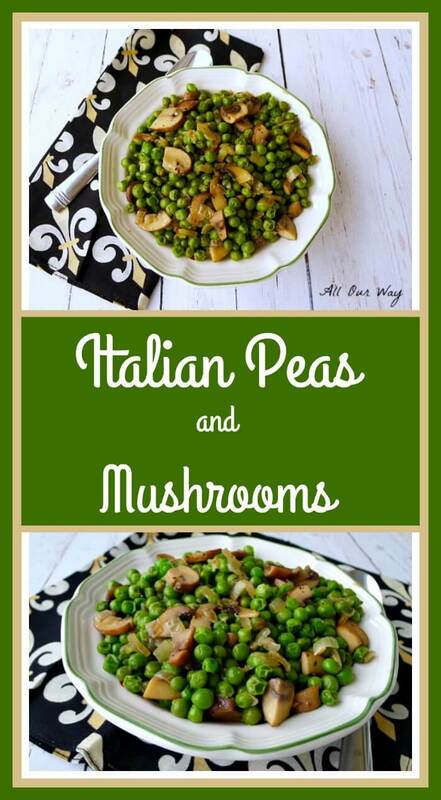 I love the combination of peas with mushroom but have never made them Italian way. There’s nothing like trying our mom’s recipes and carrying on the tradition. Love the simplicity of this dish. And the combination is classic. Buona Pasqua! Thank you, Frank. Makes me think my folks are still with us. Buona Pasqua e Buona Primavera! I haven’t tried the combo of peas and mushrooms I need to try this. Yes mom’s cooking is always best. I miss my mom and here dishes. Hello, Swathi! You are so correct — mamma didn’t add a lot of fancy ingredients to her dishes but every one of them was delicious. I’ve never had peas this way but really love the idea. Always looking for more interesting ways to eat our vegetable so have pinned for later. I’m sure you’ll like the flavor combination, Gillian. Have a good week. Love the savory herbs in Italian seasoning with this pea salad – a great way to celebrate with spring veggies! Thank you, Marlynn! We do love using Italian seasoning whenever we can. I know we’ll love this recipe, especially, me…….I like anything with peas. Thanks, for another tasty recipe? Hi, Sis! Not only do they taste good but they keep their pretty green color. Hope you have a good Sunday! Hugs to all. Cherished family memories are gold. As a gramma I am trying to make sure that my beautiful grandkids have special moments to remember as well. Coming from a Ukrainian family, mom and baba would always make holidays special with their wonderful cooking. Simple, yet perfect. I really miss those days and eating those meals. 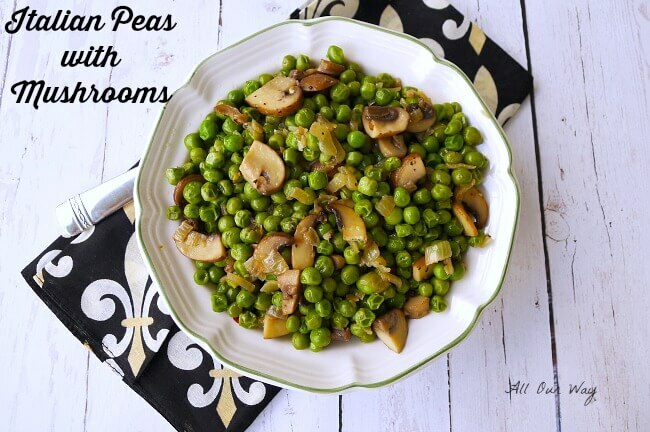 I have never had peas this way, but I love peas and mushrooms, so I will have to give it a try. Hi, Gloria! That is great that you’re doing as much as you can with the family. The family is so important. I really regret not asking more questions about our background and living several states away from them once I was married. Have a wonderful weekend. Hi, Stephanie! It really makes the peas special. Have a great weekend. Wonderful combination and a great way to give peas some character. I agree, Jovina. And it’s such a simple combination! Such a sweet sweet story, Marisa! I love to hear of your family traditions! And another great recipe to try. I’m discovering that my KY roots have sheltered me from a lot of types of cooking other than ‘down home’ style, lol. Hey!! There’s nothing wrong with down home cooking. We spend about six months out of the year in the South. I really love remembering about my folks — makes them seem like they are still here. Hugs! I learned a new phrase. Quanto Basta. I love it! And I can’t wait to try this recipe. 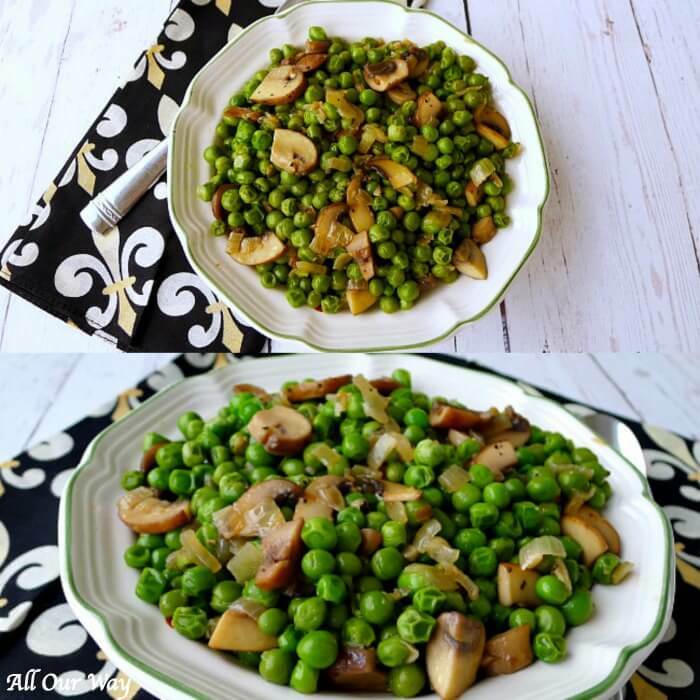 Peas and mushrooms are two of my favorites. Hi, Amy! If my readers approve, I plan on using a few more terms and phrases with explanations. If you look at an Italian recipe sometimes they’ll use just the abbreviation QB much like we’d use tsp. Buona giornata! You are so lucky to have spent such wonderful memories with your mama. My mama has lived far away from me almost all my life. But the little time that my kids spent with her they still treasure. They miss her very much. These peas truly are special. Hi, Veena! Yes, I am lucky to have had the time with my folks — I just wish I had more. Now that I’m blogging there are so many more things I want to know. If I have any advice for children it’s to ask the questions when you still have your folks. Have a great weekend! I never tire of these – part of our heritage!! The perfect side for so many meals. Bella! That they are!! I can always count on them to be a perfect compliment to any dish. Lovely post Marisa, I can tell you Italians sure know how to cook peas. I now love peas and so do my kids. These sound amazing. Thanks Marisa. Have a beautiful Sunday. There were times when my kids balked at eating vegetables — but they always gobbled up my mamma’s peas. Have a wonderful weekend. Oh Marisa! Does this recipe bring back memories. My mama used to make it, too. I haven’t had it in years (my husband won’t eat vegetables). I am going to make this recipe soon–even if I have to eat it for days—that will make-up for all the years I didn’t eat it! Thank you, thank you for this post! And have a wonderful Easter with your family. Your Welcome, Diane. Buona Pasqua! Wonderful memories – they are so great to have. And, as with all Italians, they usually are around some kind of recipe or dish. Peas and mushrooms a classic. What a beautiful and meaningful post Marisa, you’re exactly right, that’s what life is all about! Thank you, Marie. Buona Pasqua.